Known for its humor, dialogue, and gentle spoofing of the Gothic novel, Northanger Abbey is the story of young, guileless Catherine Morland and her journey from innocence to experience. 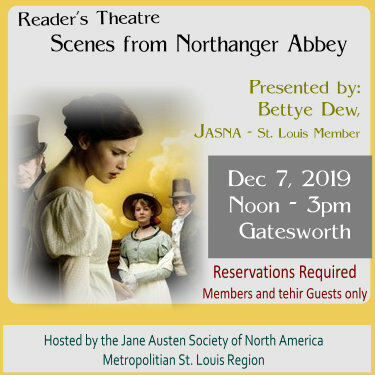 This readers’ theatre presentation will offer scenes from the novel that illustrate Catherine’s growth—first, as she travels from her cozy village of Fullerton for a six-weeks’ residence in worldly Bath, and then, the plot thickening, as she arrives at Northanger Abbey, home of the Tilney family. Along the way, Catherine learns a few lessons about human nature, the workings of the world beyond Fullerton, and the differences between fiction and reality. And, oh, she also learns about love. 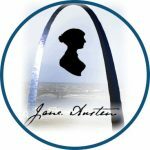 This program, while largely the work of Jane Austen, is an adaptation for readers’ theatre by Bettye Dew. Bettye has been a member of JASNA-St. Louis since 1980. She was program chairman of the 1984 JASNA AGM held in St. Louis and has presented numerous programs for the local region through the years. She particularly enjoys Jane Austen’s incomparable dialogue, a feature as delightful on the stage as it is on the page. Bettye has worked as an editor, as well as taught English, ESL and writing.